Back in September, I wrote here about how I’m excited for a new Mario game in a way that I haven’t been since I was a kid. This week, Nintendo surprised fans with an additional reason to await Super Mario 3D World: an unlockable fifth character, Rosalina. What’s notable about Super Mario 3D World is that it’s part of the “main” Mario series — that is, not a tennis game and not an RPG — and it has Peach as a playable character for the first time since Super Mario Bros. 2 was released in 1988. But by adding Rosalina to the roster of playable characters, Nintendo has done something interesting: Peach is no longer the girl but just a girl — one of the female characters you can play as, not the only choice. This has never happened before in the history of Mario games — the hop-and-bop, grab-the-coin games where you save a princess at the end only this time you’re not saving the princess because for once she’s on the other side of the jail cell door. In making Rosalina playable, Nintendo has allowed you to play as God, more or less. 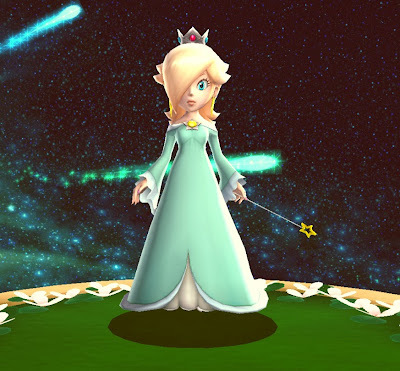 As it’s explained by the Game Overthinker, the Galaxy games explain that Rosalina is Lady Galactus, Creator of Worlds, whose job is creating, nurturing and controlling the galaxy. Basically, she’s responsible for all existence everywhere. So what is a seemingly omnipotent cosmic mother giantess doing hopping and bopping and coin-grabbing? Couldn’t she just blink the bad guys out of existence? I can only guess that she’s slumming it — seeing how the normal live, like a certain monarch who thought it would be a lark to play peasant. It doesn’t have to make sense. She’s God. She gets to do what she wants. Funny side-affect of this, however: If you play as Rosalina and play badly, you get to kill God. That’s deep. Have fun with that, kids! 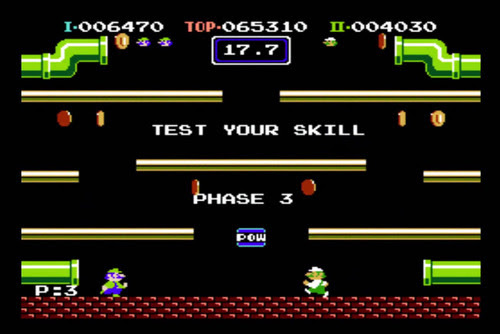 BTW, the game also includes a uniquely Luigi-centric version of the arcade game Mario Bros. It’s Luigi vs. Luigi. If we’re considering names for the palette swapped, alternate Luigi, can I suggest 2uigi? What was the first Mario game (tennis, golf, kart, etc) to have more than one girl character? I don't think Rosalina is quite omnipotent... at least, not in a "blink you in/out of existence" sort of way. Otherwise, she probably wouldn't need Mario's help, among other things. Anonymous: Peach and Daisy were both in NES Open Tournament Golf. SMB2 had Birdo, if you're not particular about what the other female character does. If you mean with both playable, I think that would be Mario Tennis on N64. Maybe she can't blink anything out of existence, but if she herself can trek out their in her high heels and stomp on bad guys, then why did she need Mario in the first place? Also, I think Wrecking Crew ’98 might have been the first Mario game to feature more than one female playable character. You could unlock a little girl character, Onnanoko, whose name actually means “young girl,” in multiplayer mode. And then that N64 Mario Tennis was preceded by Mario Golf, in which you could play as Peach, Plum and Maple. You could also ask why Peach always needs Mario when she's equally competent in the games in which she's playable. Probably just because of really lax security at her castle. I have to wonder why Rosalina is playable in a main series game before Daisy is, but I'm glad there are two playable female characters at all. There WAS an Astronaut Barbie back in the eighties, but I'm still not sure she'd be much like Rosalina. I know this comment is late, but Rosalina is not a God (Goddess?) When you meet her you learn she watches and protects the cosmos. She doesn't create them. In the ending of Super Mario Galaxy she says "Do you hear the baby stars? These newborns will grow up to become galaxies someday. When stars die, they turn to stardust and scatter across the cosmos. Eventually, that stardust reforms to create a new star... And so the cycle of life continues. But the cycle never repeats itself in quite the same way.... So...you'll see." She doesn't control how galaxies and such are created or how they die, she says it's a cycle. If she could control it she wouldn't have had a problem with Bowser in the first place. She just oversees everything and makes sure the universe is in balance.